Torque motors, used to transfer momentum between the wheel and the spacecraft body, may be of two types: an AC two-phase induction motor or a DC brushless motor. Because the AC motor requires no brushes or sliprings, it has high reliability and a long lifetime, but also low efficiency, low torque, and a high operating speed. The high-speed motor requires use of a gearing system, with associated friction and backlash problems. By comparison, DC motors are efficient and provide high torque at low speed, thus allowing direct drive without gearing. .The conventional brush commutators are normally replaced with electronic or brushless commutation. Because of evaporation, bearings have a lubrication problem when the seal is exposed to the space environment. Low vapor pressure oils and labyrinthine seals have been used, for example, on the Atmosphere Explorer series. Also, dry lubricants, such as Teflon® compounds, have been used on spacecraft, such as SAS-1, although Teflon may deform under impact during launch. With small momentum wheels, completely sealed systems can be used. With reaction wheels, which may go through the zero-speed region, special care must be taken to minimize static friction (often called stiction). Recent work has been done on prototype magnetic suspension systems which have the potential of avoiding wear altogether [Sabnis, et al., 1974]. Tachometers, which measure the wheel speed, often consist of a wheel-mounted magnet and a fixed sensor, such as a simple pickoff coil. The pulse train can be converted to a DC voltage for use as a controlling error signal for either a constant speed or a commanded variable-speed mode. Another type, the DC tachometer, uses the back electromotive force (emf) generated by the armature winding to produce an analog voltage proportional to the rotational speed. Optical encoders are also used with light-emitting diodes. Dual-Spin Spacecraft. A dual-spin spacecraft is one which has two sections with different spin rates. It usually consists of a despun section and a flywheel. The dual-spin OSO spacecraft are somewhat different, however, with a despun "sail" section containing Sun-pointed instruments, while a "wheel" section, rotating from 6 t° 30 rpm, provides angular momentum and the requisite stability. Because the wheel section contains experiments and requires three-axis attitude determination, it is considerably more elaborate than a typical momentum wheel. Momentum" wheels may be operated at either a constant or a variable speed and are used to control the spin rate and attitude about the wheel axis. The former application is less common and generally is used only on satellites such as GEOS-3, where a large gravity-gradient restoring torque (see Sections 172, 18.5, and 19.5) is available about the wheel axis. 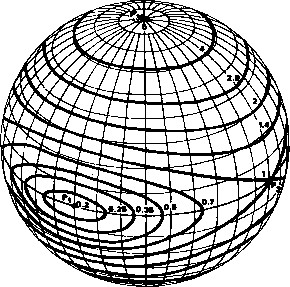 A momentum bias design is common for dual-spin Earth-orbiting spacecraft, in which a momentum wheel is mounted along the pitch axis, which is controlled to orbit normal. This allows the instruments to scan over the Earth. For example, the AE series was designed to operate with a nominal angular momentum of 125 kg-m2/s with a wheel capacity which allows operation of the body either despun at 1 rpo or spinning at 4 rpm. An integral wheel horizon scanner provides information for closed-loop pitch control and open-loop roll/yaw control using magnetic coils. The SAS-3 spacecraft uses its momentum wheel in several different operational modes: spin rate control mode using gyro rate sensing, Earth-oriented mode using horizon scanner pitch data, and a three-axis stabilized mode using star camera data for pitch control [Mobley, et al., 1974]. Practical problems which should be considered in the design of momentum wheel systems include bearing noise, quantization, jitter, variation of the bearing friction with temperature, offset of the wheel axis from the body principal axis, and nutation. Difficulties have been experienced on the AE series in dissipating nutation with a distributive damper. It is suspected that a mechanism such as standing wave patterns reduced the effectiveness of the fluid-loop damper. Control system problems may occur, especially in switching from the spinning to the despun mode, where there may be difficulty in achieving pitch lock if the body rate is too high. Normally, three reaction wheels are used to control a vehicle, with the wheel axes aligned with the body principal axes; a redundant fourth wheel is also common. A redundant fourth skewed wheel has been flown on IUE and the MMS series as a provision against failure of one of the orthogonal wheels [NASA, 1974 and 1975], Also, a nonorthogonal four-wheel configuration has been designed for HEAO-B [Rose and Hoffman, 1976]. 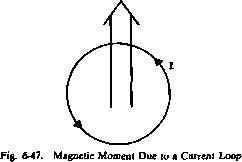 Magnetic coils, or electromagnets, are used to generate magnetic dipole moments for attitude and angular momentum control. They are also used to compensate for residual spacecraft biases and to counteract attitude drift due to environmental disturbance torques. It is apparent from Eq. (6-20) that to generate a requisite amount of dipole, parameters such as core material, ¡i; coil configuration, N and A; and the current level, I, must be appropriately selected. The selection is dictated by mission requirements and is influenced by considerations such as weight, power consumption, and bulk. The choice of the core material is the most important design parameter. Ferromagnetic materials, such as Permalloy (78% nickel, 22% iron), and Permendur (50% cobalt, 50% iron) have very high permeabilities and, when used as core materials, lead to a substantial reduction in power consumption as well as bulk. However, ferromagnetic materials have magnetization curves which saturate at relatively low values of applied magnetic field intensity and exhibit both nonlinear-ity and hysteresis. Moreover, in ferromagnetic materials, permeability is a function of the magnitude of the magnetic field intensity. (See, for example, Jackson .) Consequently, with ferromagnetic cores, it is difficult to predict accurately the magnetic dipole moment and, hence, they have been very infrequently used. Magnetic coils on most satellites have "air" cores. The material of the current-carrying element is chosen on the basis of weight and ability to dissipate the heat generated by the current without an adverse impact on the electrical properties. For example, SAS-3 used coils wound with no. 18 aluminum magnet wire of 1.02-mm diameter. Table 6-12 summarizes pertinent information concerning the spin axis magnetic coils flown on some representative missions. Table 6-12. Characteristics of Spin Axis Magnetic Coils on Representative Missions. See Appendix I for mission details.